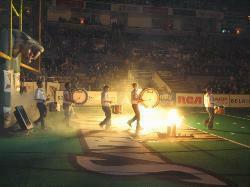 Amidst the sound and flash of pyrotechnics, the Vanguard Cadets percussion section marched onto the Astroturf at the HP Pavilion for the opening ceremonies of the San Jose SaberCats arena football game on March 17. This was a major public performance opportunity for the Vanguard Cadets, and was well received with applause and cheers from the arena fans. View a photo gallery from the event on www.scvanguard.org.